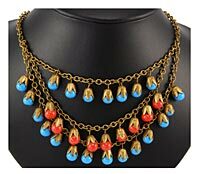 A Victorian era fringed necklace comprised of brass chain from which dangle ornately capped turquoise and coral glass beads. 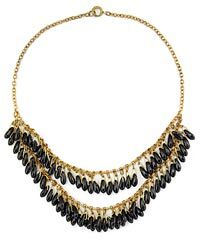 A lovely variation on the fringe necklaces so popular during this time period. The chain is a very nice medium weight, not to heavy. The brass caps on each bead are delicately embossed. Closes with elegantly engraved clasp that is in excellent working condition. Not hallmarked. Item # 20046 Price: SOLD $175 USD Tell me more! Victorian gilded lilies ornament this lovely festoon necklace. Created from brass that has been washed with gold. The engraved chain swags between the lilies feature taille d'epergne enamel work. Hallmarked, Pat Pend. The necklaces closes with a spring clasp that is in excellent working condition. Item # 10859 Price: $145 USD Tell me more! A Victorian choker created with sparkling faceted amethyst glass beads. The large beads are terminated at each end with gold gilded brass filigree caps. The central medallion is gold gilded brass that has been stamped with an ornate pattern of scallops and feathers. The rhinestones at top, bottom and sides of the medallion are pale amethyst with a foil backing. Each sparkles brightly. The central stone is a marquise cut piece of amethyst glass. All stones are bezel set. The necklace closes with a spring ring clasp that is in excellent working condition. Item # 10886 Price: $225 USD Tell me more! An ornate Victorian creation set with sparkling pink rhinestones. Comprised of base metal that has been gold washed. The elaborately stamped pieces into which the rhinestones have been set, are actually circles of metal that have been folded in half. The back of the necklace is as beautiful as the front. 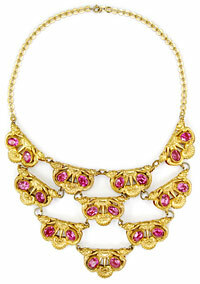 The large faceted pink glass rhinestones are bezel set securely into the ornamental half circles. The backs of the stones are gold foiled so that they sparkle with pink fire. Item # 10804 Price: $225 USD Tell me more! 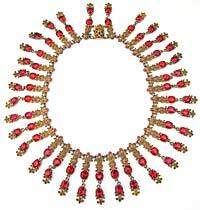 A lovely gilded brass fringe necklace from the Victorian era. Each link in the chain has been elaborately engraved. From the chain, hang gilded brass tube flowers. The tips and bases of the flowers have been created from pieces of faceted glass. The necklace closes with a spring ring clasp. Extremely Fine condition with no damage or repairs. Item # 10774 Price: $175 USD Tell me more! 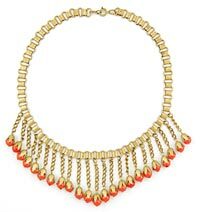 A flamboyant flapper era fringe necklace with a hint of Egyptian design. King Tutankhamen's tomb was opened in 1922 and the world of fashion fell in love with the Egyptian look. Created from brass chain and tear drop shaped French jet glass drops. Extremely Fine condition with no damage or repairs. The brass has aged to a lovely patina and the glass is in excellent condition. 16-1/2 inches long. Item # 10803 Price: $125 USD Tell me more! 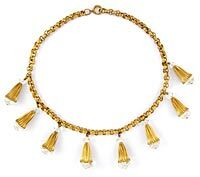 A Victorian era fringe necklace created from brass that has been washed with gold. Coral glass beads dangle from the ornately stamped bookchain. The beads are glass but could easily pass for coral. Closes with a spring ring clasp that is in excellent working condition.Not hallmarked. Item # 10879 Price: $275 USD Tell me more! Beautifully crafted copper by Francisco Rebajes. 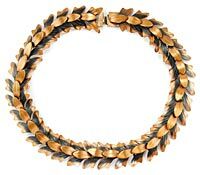 Comprised of segmented pieces of copper that overlay one another creating an articulated style of necklace. The necklace moves with you almost as though it is a part of you rather than just something hanging around your neck. The coloration of the copper from dark to light is intentional and adds to the piece's three dimensional quality. 16 inches long x 5/8 inch wide and 3/8 inch high. Hallmarked. Item # 10856 Price: $175 USD Tell me more! 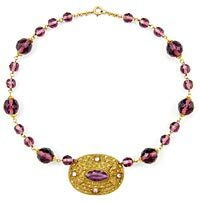 An ornate Victorian creation of gold washed brass and faceted red-violet glass. The colour of the glass is rather unusual. At first glance it appears to be a true red but when looked at in bright light, the red sparkles with violet and fuschia shades. I was not able to capture the nuance of colour in my photos. The larger oval faceted glass stones are prong set in intricately detailed brass fringes. The necklace closes with an elaborate filigree box clasp. Very Fine condition. Item #10722 Price: SOLD $275 USD Tell me more! 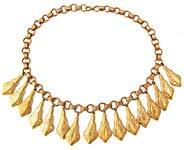 A Victorian era fringe necklace comprised of heavy brass chain from which hang stamped brass dangles. The dangles appear to have retained all of their gold washed finish. The brass chain has lost a bit of its gold wash but has aged to a lovely warm patina. Extremely Fine condition. Item # 10717 Price: $125 USD Tell me more!